NaNoWriMo was first - a movement to write a novel in a month, or at least, write fifty thousand words of a first draft of a novel. If the novelists could have a month, then why not the poets? And so someone started NaPoWriMo. Which is like NaNoWriMo, but different. It's the differences that are causing me problems. Firstly, in NaNoWriMo, there has never been any suggestion as far as I can tell, that you should post your fifty thousand words on your blog for the world to see. There are all sorts of ways to connect with other people doing the same thing, there is merchandise to buy, there are ways to be accountable for your goals, but posting your work on the net isn't one of them. 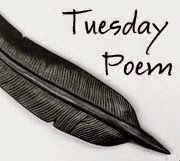 There are currently two places I know of posting daily prompts to assist the poets, (here and here) but to really join in the fun, you have to post your work. Which is a problem because firstly, it is bound to be a very rough draft (unless you are extraordinarily talented) and secondly, if you want to have your work published in a print (or online) journal, there are fewer and fewer editors who will consider work that has appeared on the internet, even in rough draft form. The second problem for me is the idea of a "poem a day". For some, that might work. Others, like me, may have days when there is little time to write. Days when I work all day, get in my daily walk on the way home, throw some dinner on the table and go out again to meet an evening commitment. In NaNoWriMo, you can write consistently about 1700 words a day - or you can write 12,500 words every weekend - quite doable - or have a binge over the last few days and do it all then, or whatever you like. The "rules" of NaPoWriMo seem much more rigid. None of which really matters - after all, I'm a grown-up, I can make my own choices. However, I do like the accountability, the idea that lots of other people are all aiming to write lots of poems this month, the sense of companions on the journey. So, for what it's worth, I am attempting to write thirty very rough drafts this month. There won't be any haiku, because I don't feel as if they really count. Not that good haiku aren't poems, but it is so easy to write a bad haiku that it's too tempting to dash one off and call that my poem for the day. Each poem will have a title, and be of reasonable length, and you won't see it here because it will need lots of revision some time after the end of the month. And just for an added challenge I'm toying with the idea of having at least one title for each letter of the alphabet. (Kelli Russell Agodon's book Letters from the Emily Dickinson room was my inspiration for this idea). I'm not sure if I'll manage it, we'll see. So far, I have four very rough drafts, one title with a chunk of brainstorming - too early to call this even a rough draft - and a sixth title with a sort of an inkling of the structure of the poem that will go with it. So I am up to date at the moment, no doubt I will slip back during the week and need a catch up next weekend. She tried hard to be like the others/she struggled to catch a ball/she never quite managed a cartwheel/after much practice she stood on her head./When she grew up she turned to science/she thought she would turn the world upside down/after a while she realised that the world had stayed in its proper place all along/and she was still standing on her head.